Share analytical assets from a central repository, and allow users to control how they see and use analytics. Collect information on decision outcomes to refine predictive models. Run jobs on demand, or on a set schedule, or when triggered by other events. Benefit from an automated process for evaluating predictive models that uses a champion-challenger approach. 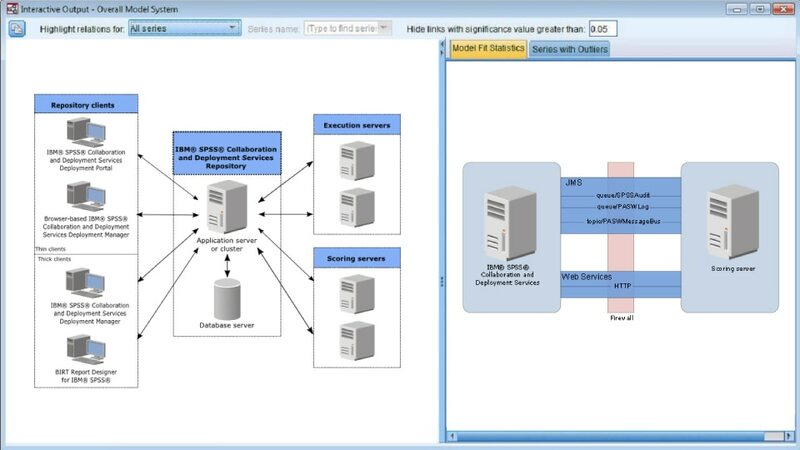 Deploy streams created in SPSS Modeler, and take advantage of application server clustering and virtualization. Integrate with IBM System z to increase the impact of your analytics investment. Control access to analytical assets and use version control to ensure that the right copies are being used in production processes. Software requirements for SPSS Collaboration and Deployment Services can be found here. Hardware requirements for SPSS Collaboration and Deployment Services can be found here.